A GREAT BREAKFAST OR 'SUPPER' GOES NICELY WITH GRITS, HASH BROWNS AND FRESH FRUIT! Brown sausage with onion and pepper. Cook fresh mushrooms a minute or so. Drain sausage mixture on paper towel. Blend eggs and milk. Butter 9"x13" baking pan. Put bread cubes in bottom of the baking pan. Spread cheese over bread. Then sprinkle sausage mixture over all. Preheat oven 350. Bake for 45 min-1 hour or until set. This will serve around 6 adults. Other ingredients can be used or meat can be omitted or other meats substituted. Plus 142 othersFrom around the world! Like Lynnsuzette I would like to know WHEN DO YOU ADD THE EGG AND MILK MIXTURE??? when do you add the egg mixture? I am cookin something else for dinner but will cook this and give a comment how it went but this sounds very good. Mayb a garnish of paprika. This is definitely a breakfast for champs!! 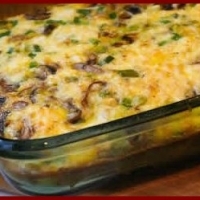 Oh yes this sounds so good love egg casseroles to goes with just about any thing. Got my 5'er on this one to. I love this not only because it's a wonderfully satisfying comfort food, but also that it makes a lot and that you make it the day before. Nothing better than just having to pop something in the oven! High-5!! I really like this, and have to try making it. Five forks. Thanks for posting. It give me the motivation to actually cook breakfast. I complain i always eat cereals in the morning because i'm to lazy to cook!! I never thought of making an egg casserole and your's sound delicious ! Oh yumm! Definitely saved this one to try. I agree with the other person that said it would be great for Christmas morning! I would probably substitute shredded hash browns in place of the bread...I bet that would be good too! Thanks for sharing! Hey there Lana, Just one question, when can we come for breakfast? This looks wonderful...can't go wrong with sausage and cheese! May fix this for supper tonight but will have to cut it down for just the 2 of us. Thanks for the invite, also. I love this! I have to agree, be just as good for nighttime supper, as it is for breakfast.